I love black and white decks. There is something so mystical and mysterious about them to me. One of my top 5 decks is the Hermetic Tarot, it is just so striking and filled with symbolism. I’m glad that we are starting to see more black and white decks produced. I feel that this has been an area sorely lacking for some time. 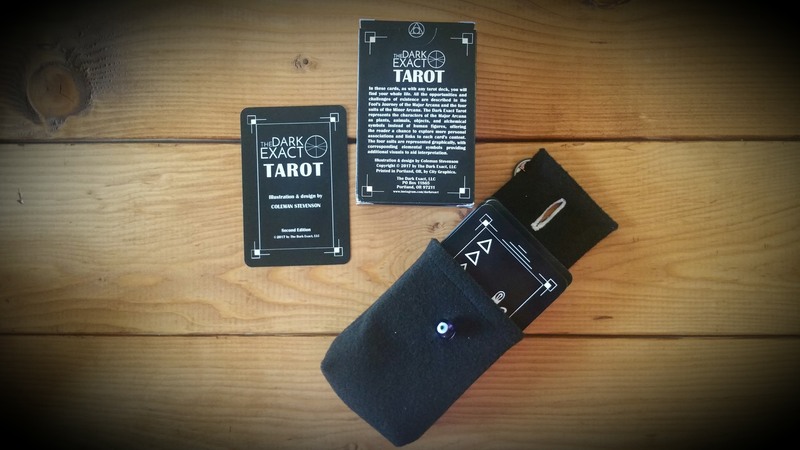 The Dark Extract Tarot is produced by Coleman Stevenson in Portland Oregon (I’ll be going there in June for vacation woo-hoo!) . Her Etsy can be found at the end of this review and I urge you to go support her in this endeavor. This is another that I have been keeping my eye on. It is currently in its second edition, which is what I am reviewing here. Lets start off with the packaging. You have three options when ordering. You can receive it in the standard cardboard flap box or upgrade to a pouch or felt case. I originally ordered this deck with the felt case. 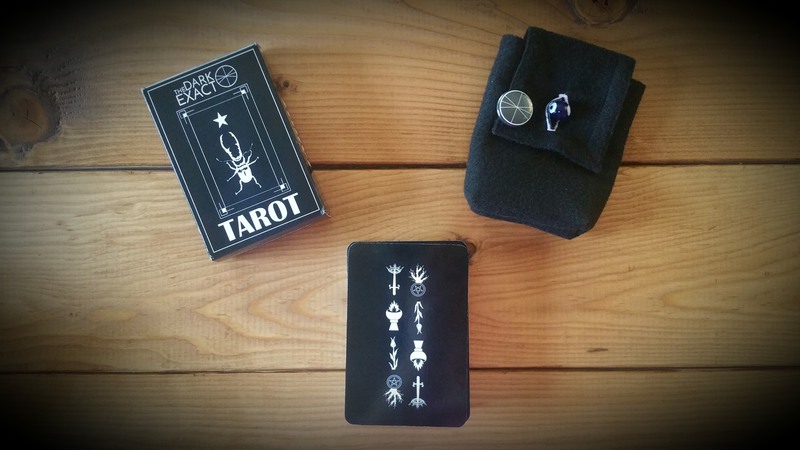 I usually keep my tarot cards outside of the boxes in little pouches so the boxes and the cards don’t get so worn. I love to keep the boxes on display on my bookshelf. After I ordered this I quickly messaged her and requested to also receive the box and she was kind enough to oblige. I love the little felt pouch made by Omnicollective, I definitely think it is worth the upgrade. The cards fit so snugly. It just looks nice on my altar. It is sturdy and very well made. This could be great for traveling. This is a very striking minimalist deck. It relies on your intuition. I can see those who rely heavily on the Rider Waite tradition will have difficulty, which can be a good thing as that this deck will force you to look at the cards in a different way. Tarot is so much more than the Rider Waite tradition and I love seeing decks that challenge that. 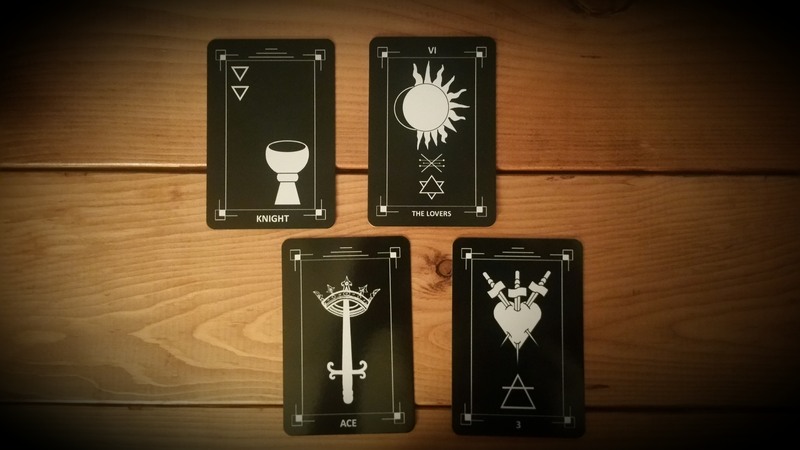 Every card features very minimal symbolism in both the major and minor arcana. This deck has an almost art deco quality to me, which adds to its uniqueness. 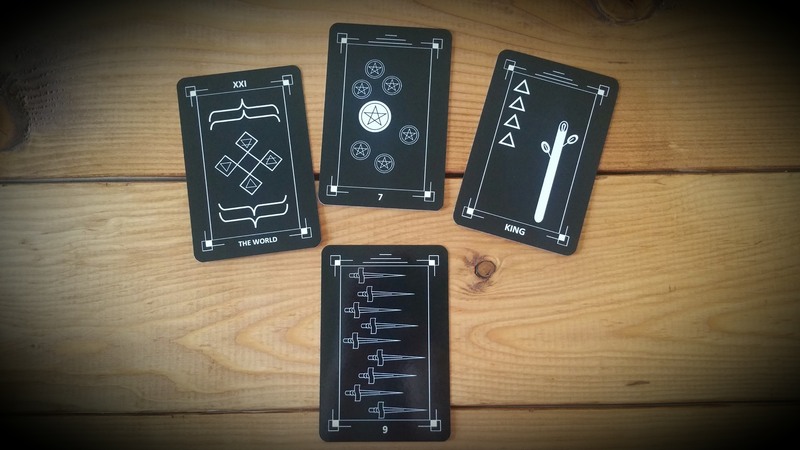 Each card has just enough symbolism to allow your mind to come to its own interpretations. It relies heavily on sharp lines, geometric symbols and unspoken symmetry to tell its story. I’ve been using this deck for my daily card pulls and have really been enjoying exploring and reflecting on the images. The cardstock is very smooth and glossy. Initially I had trouble shuffling these cards. They were sticking together out of the box. They have become more easy to shuffle over time. They are a good standard size and fit well in the hands. My only complaint is that the cards are so glossy fingerprints can easily be seen on them. But the black glossiness is so gorgeous that it is easy for me to get over. One suggestions I would make is after purchasing this deck is to go through one by one and separate each card to get rid of the stickiness also if your like me you want to go through and look at each card one by one and soak each one in. Overall I think this is a unique deck that could be great to add a special flare to your readings. If your looking for a minimalist non-traditional deck this is it. Some people will be drawn right off the bat to this deck and others will automatically be turned away. It reminds me of the Orbi-Fold tarot which has the same effect on people either way. Personally I am so glad to have this one in my collection and really look forward to seeing what Coleman comes out with next. One a side one I have started an Etsy shop of my own. It is focused on Tarot readings and my jewelry pieces. Besides Tarot, jewelry making is a creative outlet for me and helps keep my occupied while my husband is working. I just started making enough pieces that I feel ready to part with some of my collection.